Wine tasting close to Prague! 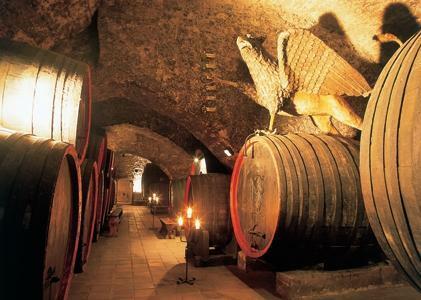 Visit not only the Melnik Castle, taste the private estate wines of the Lobkowicz family. For 9 people and more, a wine cellar master explains the wines. For smaller groups, each wine is described in writing on the vats. Have lunch in the castle restaurant before or after the wine tasting from which you have a fabulous view of the confluence of the Rivers Vltava and Labe. For individuals, after your guide and vehicle with driver pick you up in your hotel or location of your choice, you will be driven north to the city of Melnik. After your approximately 1 hours drive, you will take a tour of the castle with your guide. After, it’s time for your wine tasting. In the newly opened "Wine Atrium", located in the wine cellar, try different wines as you go. Each is described well on the appropriate vat in writing . Have lunch in the beautiful terrace restaurant overlooking the confluence of the rivers. The cuisine is first class! For groups: combine the wine tasting with a group lunch. Please let us know your budget. History of the Castle: Since Princess Ludmila, the grandmother of the Good King Wenceslas, who was born in Melnik, the castle has been the residence of the queen widows of Bohemia. Under Emperor Charles IV, Melnik became a royal town. His last wife built the chapel of the castle with its gothic vaults. The last queen who resided in Melnik, was the wife of king Jiri of Podebrady during the 15th century. In the following years, the estate of Melnik became the property of different noble families. In 1542 the castle was reconstructed in renaissance style and the two arcades, richly decorated with sgrafitto patterning, have been added. During the Thirty Years War, 1618 – 1648, the castle was abandoned. In the year 1646 Count Czernin started a major reconstruction and had the early barrock southern wing added. The Count purchased the Melnik Estate from the Emperor Ferdinand II. The heiress of the Czernin family, Countess Ludmila Czernin, married Prince August Anton Lobkowicz in 1753. With the exception of the Second World War and the 41 years of communist rule, Melnik Castle remained in the Lobkowicz family. About Czech vineyards: The vineyards of Mělník lie approximately 35 km north of Prague at an altitude of 200 metres above sea level. 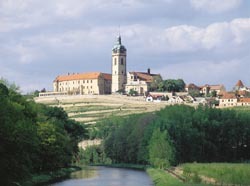 Mělník forms part of the Czech wine region, one of the northern-most viticultural areas of Europe. The vineyards of Bohemia do not form a contiguous wine region but consist of several vine growing districts situated on the south-facing slopes of the valleys of the rivers Elbe, Vltava, Berounka and Ohře, each with its particular microclimates. The vine growing district of Mělník has 160 hectares, the largest vineyard area in the state of Bohemia. Additionally, please add the wine tasting of your choice and the entrance fee into the castle. Entrance fees into the castle is EUR 5 per person for groups of 9 or more and EUR 7 per person for individuals. It is included with the A4 tour below. For groups of 9 or more people - minimum. In case of less people, the minimum needs to be paid. Please inquire regarding a date. This is not available at all times. Please note, the wine tasting prices may differ due to price changes beyond our control. Please inquire.